(StatePoint) Let’s face it; rust is unavoidable. It’s unsightly and if left unchecked, it can lead to costly damage to homes and automobiles. From lawn mowers and shovels to fences and furniture, if it’s metal and exposed to moisture, it is vulnerable to rust. However, just because an item has corroded does not mean it’s time to pitch and replace. In fact, rust repair can often be a simple project that makes for a great summer weekend DIY project. Rust occurs when moisture and metal mix with carbon dioxide in the air. This combination causes immediate damage to the metal. It’s important to address rust spots as soon as they appear. Once rust becomes so extensive that holes develop, it becomes necessary to replace the item entirely. Along with some mild weather and a little elbow grease, a rust-free backyard is just a few tools and simple steps away. First, use a wire brush, steel wool or sandpaper to remove any loose rust, flaking paint and debris from the surface. This step is where you can determine if what you are working on is salvageable. Surface rust can be stopped and sealed without much trouble. However, if corrosion has eaten through the surface, leaving a hole in the substrate, it’s most likely time to replace the item. For surfaces with an identifiable grain pattern, be sure to brush with the grain. For harder-to-reach surfaces, such as intricate wrought iron, railings or fencing, a drill can help clear out loose rust and debris. The next step is to seal the surface from oxygen to stop the corrosion process. Once the surface is free of loose rust and debris, a coating designed specifically for rust prevention, such as RustProof M/D from Martin Senour Automotive Finishes, is ideal. For maximum protection, apply a second coat after two to five hours. If necessary, wait another two to five hours before applying an additional topcoat layer for extra UV protection. 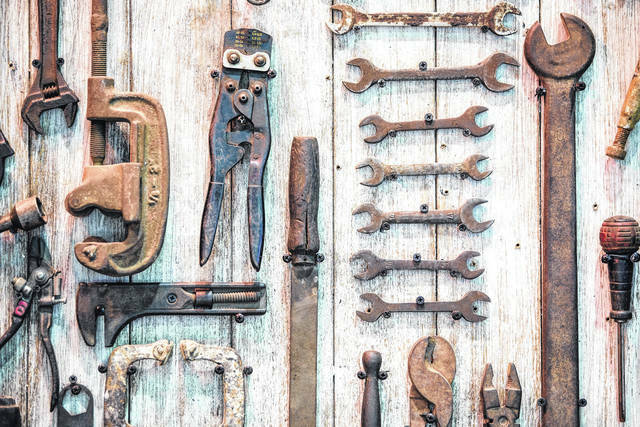 Before tossing rusted items, remember, this process is not only easy, but applicable for countless common household items prone to rust, including garden tools, appliances, auto parts, gutters and downspouts and even basement window frames. It’s easy for homeowners to clean rust from many items, including garden tools, appliances, auto parts, gutters and downspouts and even basement window frames.